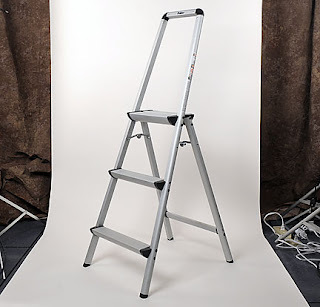 Well I don't know if it is the best non-photo accessory I own, but I can tell you that since I purchased the Polder Ultra light Aluminum 3-Step Ladder in 2006, I have not regretted it. This ladder is sturdy, only weighs a few pounds, and is easy to carry over a shoulder. And because of the extended top, gives you something to lean against so that you can concentrate on shooting and not balancing. This piece of equipment seems to come in handy several times a month. The little bit of elevation it provides is nice when taking group shots and if I'm covering a conference, it allows me to see over the crowd from the back of the room or puts me at eye level with a speaker who is on a podium. I have even carried this with me on the Metro when covering events in the Washington D.C. area. It also comes in handy for its intended use as well since none of the offices in the building I work at allow you to turn off the lights, I have remove the fluorescent light bulbs in order to control the lighting when conducting video interviews. I have to credit a friend, photographer Johnny Bivera, who I first saw using this ladder when he was the Secretary of the Navy's personal photographer. For around $60, it's a bargain and will provide you with more than just a height advantage. I noticed a slight difference between the ladder available for sale today and the one I'm using, but I know you won't be disappointed.